Adina Acevera and other seniors at Brooklyn's Macon Library have teams and tournaments, complete with matching shirts, for Xbox bowling. 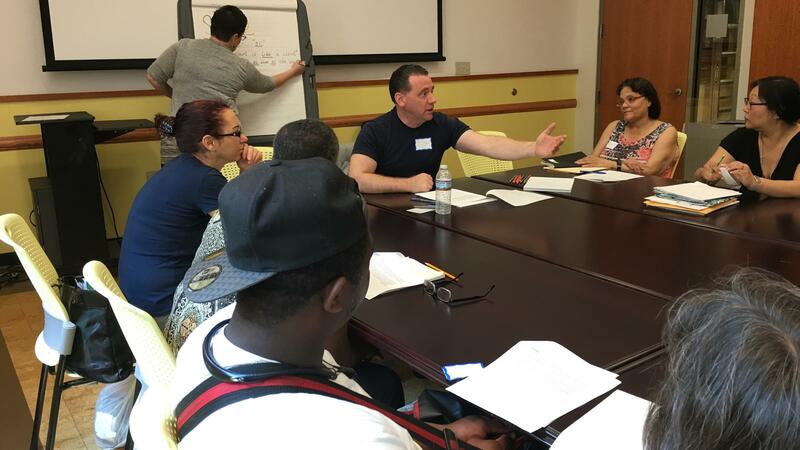 Poet Dave Johnson is one of the teachers of an 8-week memoir writing class at the Brooklyn Central Library. "They have exercise, they have classes for kids. It brings everybody in," says Baker. "You can bring your family with you." Some of the programs — virtual bowling, for instance — don't strike people as part of a library's mission. Nick Higgins, director of outreach for the Brooklyn Public Library, sees it differently. "A good library reflects the needs of its particular community," he says. "Our older adult community is growing rapidly. ... They're starting to exhibit some mobility issues. They're looking for opportunities other than movie night, something active and social. And the public library is a perfect space for that to happen." 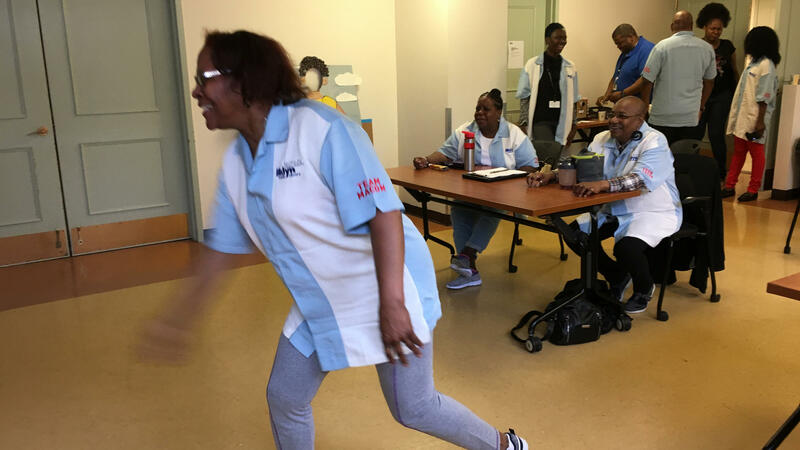 At Brooklyn's libraries, there are now twice as many Xbox bowling teams for seniors as there were last year. One can see why at the Macon Branch. With a lot of team spirit on display, a dozen or so people are all wearing matching bowling shirts. They take turns facing a large screen displaying the alley and pins, then go through the motions of bowling as if they had a ball. As each one steps up to the line, the room echoes with shouts of encouragement, cheers for a strike, and groans for a missed spare. But it's not only about fun and games. Arts courses for older adults have also expanded. And participation is up by more than 50 percent since last year, maybe because of the wide array of options, from watercolor painting to salsa dancing to story-telling. On a Wednesday morning at the Brooklyn Central Library, the class is memoir writing. Poet and playwright Dave Johnson is one of the teachers. "As you tell the story, I want you to also use simile and metaphor," says Johnson. "I mean, you might say, yeah, he's a little bit like a porcupine, right?" None of the people in the class are experienced writers. A few have only recently learned to read and write in one of the library's adult literacy classes. For this day's class, they're supposed to write something about the differences between members of their families. "Of course you can make it up," says Johnson, laughing. "We're not gonna know the difference." But 77-year-old Lawrence James — a retired New York transit bus mechanic — doesn't make anything up. He reads his work to the class: "My mother very religious, God-fearing, a good provider, but distant like Africa." His oldest brother the "symbol of success," his other brother "a mystery," his step-father "without a spine." He concludes, "Somehow I felt like a visitor there ... many different personalities, but all seeking something, all avoiding something." The room is silent for a moment when he finishes reading. Then the spell is broken with applause from his classmates. James says he comes to the library a lot. He says he prefers the mix of people there to what one would traditionally find at a senior center. But he concedes that's probably an unfair image of what senior centers are. "I have this stereotype in my head," he explains. "Sometimes some centers limit the activities of seniors to like bingo, yoga, and some things that I'm just not interested in." The memoir class is sponsored by an organization called Lifetime Arts, which develops a variety of arts classes for older adults. Contrary to James' image, Lifetime Arts also works with senior centers. But the organization is best known for its work with more than 80 public libraries in 13 states. Maura O'Malley is the CEO and co-founder. She says that whether the classes are in writing or painting or choral singing or salsa dancing, all of them are taught by professional artists, and structured to result in a final project or performance. "And that's the exciting thing about this work," she says. "It's about rebuilding connections as you age and about finding new ways of living and expressing yourself. It's not about entertainment." It's about the opportunity to write new chapters in life, no matter one's age. There's a place where older people can go to upgrade their computer skills, make art and play games. You're probably thinking senior centers. You could also think the library. NPR's Ina Jaffe covers aging, and she went to Brooklyn for this report. As the population in New York ages, the library system there is finding new ways to serve seniors. INA JAFFE, BYLINE: On a Wednesday morning, the Brooklyn Central Library's lobby cafe is crowded with young mothers and kids in strollers, friends meeting for coffee, singles poring over a book. But upstairs, there's some serious work underway. JAFFE: That's poet Dave Johnson leading an eight-week workshop in memoir writing. Everyone in the class is at least 50, though most are much older than that. For this day's class, they're supposed to write something about the differences between members of their families. JOHNSON: Of course, you can make it up. Right? People are not going to know the difference. JAFFE: But 77-year-old Laurence James, a retired New York Transit bus mechanic, doesn't make anything up. LAURENCE JAMES: My mother very religious, God-fearing, good provider but distant like Africa. JAFFE: James says he comes to the library a lot. He prefers the mix of people here to the traditional senior center, though he concedes he doesn't go to any senior centers and probably has an unfair image of what they are. JAMES: I have this stereotype in my head because sometimes some centers limit the activities of seniors to, like, bingo, yoga and some things that I'm just not interested in. JAFFE: The memoir class is sponsored by an organization called Lifetime Arts, which develops arts classes for older adults. Contrary to Laurence James' image, Lifetime Arts also works with senior centers, but the organization is best known for their work with more than 80 public libraries in 13 states. Maura O'Malley is the CEO and co-founder. She says that whether the classes are writing or painting or choral singing or salsa dancing, all of them are taught by professional artists and structured to result in a final project or performance. MAURA O'MALLEY: And that's, I think, the exciting thing about this work. It's about rebuilding connections as you age and about finding new ways of living and expressing yourself. It's not about entertainment. JAFFE: Not that there's anything wrong with that. JAFFE: At the Macon branch library in Brooklyn's Bedford-Stuyvesant neighborhood, about a dozen older adults seem pretty darned entertained by bowling. UNIDENTIFIED WOMAN: I need strikes. Come on. JAFFE: Virtual bowling, that is, using Xbox. They face a large screen that shows the alley and pins and go through the moves as if they had a ball. There's a lot of team spirit here. They even have matching bowling shirts. And there are tournaments with teams from other libraries. Seventy-four-year-old Alice Baker has been coming to virtual bowling since it started three years ago, but she's not at the library just for that. ALICE BAKER: I learned to quilt at the library, and now I quilt a lot. They also have exercise. They have classes for kids - brings everybody in. You can bring your family with you. JAFFE: If you question what Xbox bowling has to do with the mission of a library, well, Nick Higgins has heard those questions before. He's the director of outreach for the Brooklyn Public Library system. NICK HIGGINS: I'd say a good library really reflects the needs of their particular community. And so for instance, as some of our patrons are aging, they're starting to exhibit some mobility issues. And they're looking for opportunities other than, you know, movie night - something active and social. And the public library is a perfect space for that to happen. JAFFE: In fact, all of the programs for older adults are growing. The number of older people involved in arts programs is up more than 50 percent since last year. And the number of branch libraries with bowling teams has doubled. UNIDENTIFIED CROWD: (Chanting) Get that spare. Get that spare. JAFFE: Which just goes to show that older people want a chance to write new chapters in their life stories one way or another. JAFFE: Ina Jaffe, NPR News. (SOUNDBITE OF THE POLISH AMBASSADOR'S "TAKE WINGS") Transcript provided by NPR, Copyright NPR.